Picture of Ball High School, named after George Ball. Image available on the Internet and included in accordance with Title 17 U.S.C. Section 107. BALL, GEORGE (1817–1884). George Ball was born in Saratoga, New York, on May 9, 1817. At the age of twelve he moved to Albany, where he was reared and trained for business in the family of his uncle. He arrived in Texas during the cholera epidemic of 1839 and in Galveston opened a dry goods business, which he operated in partnership with his brother Albert. 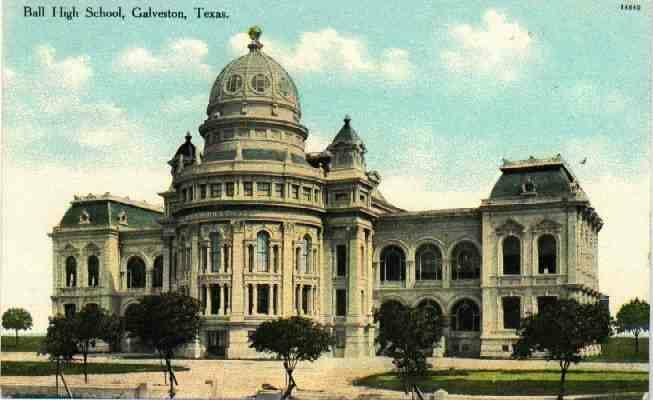 In 1847 he became a director of the Commercial and Agricultural Bank at Galveston, the first incorporated bank in Texas, and in 1854 he opened the banking house of Ball, Hutchings, and Company. During the Civil War he moved to Houston and used the facilities of his banking house and mercantile experience to aid the Confederate government by getting goods shipped through Mexico. At the close of the war he reestablished his banking business in Houston and invested in the Mallory Steamship Line. He contributed generous sums to hospitals, asylums, and public schools but always endeavored to keep his charities concealed. On April 19, 1848, he married Sarah Catherine Perry; they were parents of six children. He died in Galveston on March 13, 1884. Ball High School in Galveston is named for him. John Henry Brown, Indian Wars and Pioneers of Texas (Austin: Daniell, 1880; reprod., Easley, South Carolina: Southern Historical Press, 1978). Galveston News, March 13, 1884. S. C. Griffin, History of Galveston, Texas (Galveston: Cawston, 1931). History of Texas, Together with a Biographical History of the Cities of Houston and Galveston (Chicago: Lewis, 1895). David G. McComb, Galveston: A History (Austin: University of Texas Press, 1986). Ruth G. Nichols, "Samuel May Williams," Southwestern Historical Quarterly 56 (October 1952). Handbook of Texas Online, "BALL, GEORGE," accessed April 23, 2019, http://www.tshaonline.org/handbook/online/articles/fba46. Uploaded on June 12, 2010. Modified on September 7, 2016. Published by the Texas State Historical Association.